When Clu betrays him and launches a war against the ISOs, Flynn creates a new system monitor program called Anon to help Tron protect the denizens of the system. Evolution is a third-person action video game released in December 2010. It is simultaneously a sequel to Betrayal and Battle Grids, and a prequel to the film Tron: Legacy which was released a couple weeks later. The game features both single and multiplayer modes. Bruce Boxleitner returns as Tron and Olivia Wilde voices Quorra, whom she also plays in Legacy. The villainous Abraxas is voiced by John Glover, best known as Lionel Luthor on the TV series Smallville. In the game, the player is Anon (an often-used abbreviation for "anonymous"), a system monitor program similar to Tron. The term "system monitor" is a computer term describing a program or a system of programs which monitor the performance and resources of a computer system. Anon's face is never seen, always wearing his helmet and faceplate and he never speaks. He is later mentioned by Quorra to Sam as "a sympathetic program" who saved her in Legacy. This video game reveals that the new system Flynn has built is called the TRON System (conveniently, this also allows Disney to create a series of stories around the "Tron" label without them all having to center around the character called Tron originated in the 1982 film Tron). The system was built on a series of servers that new CEO Flynn removed from ENCOM and placed in the basement of his arcade. He intended to use the electronic world thus created, in which time proceeds at a faster pace than the real world, to allow himself (and, potentially, others) to access the data processing speeds of computers directly and accomplish experimentation and innovation more rapidly than in the real world. The main city of the TRON System is called TRON City. One of its buildings is a reproduction of the real world Flynn's Arcade. The virtual Flynn's Arcade is the entry point for users who rez into the system. The ISO character Radia may have been named for Radia Perlman, a software designer, network engineer, and author/co-author of two textbooks on computer engineering. 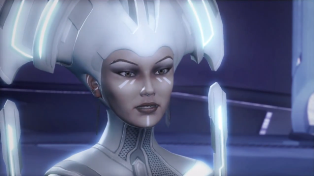 Quorra has blue circuitry here, but white circuitry in Legacy. Much time passes between Evolution and Legacy, so it may be that she has become more like Flynn under his tutelage, transitioning to his white circuitry. The standard, user-created programs in the system are referred to as basics. The story reveals that the virus character Abraxas was formerly the ISO Jalen, who was one of the original ISOs studied by Flynn, and an expert player in the Grid Games. Flynn was training him to become the co-Systems Administrator (with Clu), but Jalen was transformed into Abraxas by Clu to assist in the destruction of all ISOs. Clu arranged a false story that Jalen was derezzed in the games. Within the TRON System, Arjia City has a plaza named after him, Jalen Plaza. The name Abraxas comes from the 1993 DOS virus of the same name. The fall of Jalen to become Abraxas is somewhat similar to the fall of Tron to become Renzler in Legacy. The story reveals that the very first ISO, Ophelia (seen arising from the Sea of Simulation in "Betrayal" Part 1), became one of the original ISOs studied by Flynn (apparently alongside Jalen). "Betrayal" Part 2 seems to imply that Ophelia is actually Radia...notice that, while she wears a different outfit in "Betrayal" Part 1, in Part 2 she is dressed in essentially the same outfit and has the same facial markings as Radia does here in Evolution! If so, why the name change? Did Flynn want to hide from Clu the fact that his new co-Systems Administrator was also the first ISO to self-generate in the TRON System? After Tron's battle to protect Flynn after Clu's betrayal, Tron is assumed to be dead for the rest of the Evolution story. We know from the epilogue of "Betrayal" Part 2 that an injured Tron was able to make an escape on his light cycle. Numerous times in the course of the story, both Quorra and Gibson suggest that they and Anon split up and meet elsewhere to continue their mission to stop Clu, leaving Anon to have to face multiple threats alone on his/her way to the next meeting place. This makes a convenient reason for the video game player to fight scores of sentries and other enemies to improve his/her score, but does not make much sense in the story! The character of Gibson who appears here was first seen in the Battle Grids video game. Zuse's End of Line Club is destroyed in the course of the game. He opens a new End of Line Club sometime before the events of Legacy under his new identity of Castor. Gibson tells Anon that he rescued Flynn after his flight from Clu's forces and has set him up with sanctuary in Bostrum City. This may be a referece to Nick Bostrum, a Swedish philosopher known for his thoughts on human enhancement and the Simulation Arguement which states that there is a high likelihood that we are living in a simulation. Much more information about the people, places and things of Evolution can found at the Tron Wiki.